Mary Davis has addressed Clare County Council this afternoon in her first formal address to a council to seek the nomination for President of Ireland. The Special Olympics organiser said she spent 30 years working the areas of community, volunteering, and disability, to provide opportunity and choice for people with disability. She said she also worked internationally and she believes we need a President who can work abroad and who can influence and persuade on the international stage. Businessman Sean Gallagher also addressed the council as part of his campaign to secure a nomination for the Presidency. He said he wanted to return to the creativity of small holdings and communities, to create a new language from negative to positive, and to create a new self belief and determination in the country. The council was also addressed by Dr Pat Jones from Carlow, who is involved in medical research here and the US. He told councillors he wanted to put an end to the pomp and ceremony of the office and use the entertainment budget to have each of the 26 counties entertained at a county day in the Áras. Dermot Mulqueen, who describes himself as 'a visual artist and founder of the Fast-Forward Expressive Conceptual Art Movement', and holds a degree in Agricultural Science from UCD also addressed the meeting. Mr Mulqueen, from Ballygriffey, Ruan, Co Clare, he wanted to recreate and re-engineer Ireland, moving the 'political capital' from Dublin and setting up a new capital at the core of the country based at Moate. He said the 'financial capital' would remain in Ireland. He also wants to put the Corrib gab field into State ownership. Elsewhere, New York based publisher Niall O'Dowd is also seeking a nomination to run in the Presidential election. Mr O'Dowd says he hopes to get the support of 20 members of the Oireachtas, and says he will talk to members of Fianna Fáil, Sinn Féin and the Independents this week. Both Fianna Fáil and Sinn Féin have said they will meet with him to discuss his plans. 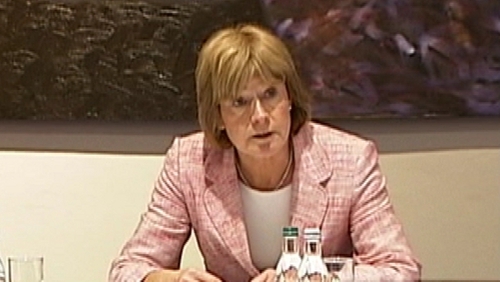 Meanwhile, fomer MEP Avril Doyle has yet to say if she will seek the Fine Gael nomination to stand in the election. It is understood she will announce her intentions tomorrow. Three others are already seeking the party nomination which is due to be decided on the 9 July. There is confusion tonight about claims that Longford County Council has voted to nominate businessman Sean Gallagher to run in the Presidential election. Fianna Fáil members on the council claim a motion put by party councillor Martin Muleady for Mr Gallagher to get the council’s backing when nominations officially open later this year was sucessfully passed by ten votes to nine. This assertion has been backed by outgoing chairman of the council, Independent Paul Connell. Fine Gael claims, however, that the only thing voted on was an amendment to the motion proposed by Fine Gael Cllr Alan Mitchell, which was defeated. Cllr Mitchell says the original motion was not put to a vote. Mr Connell said however that the original motion passed with the defeat of the proposed amendment.